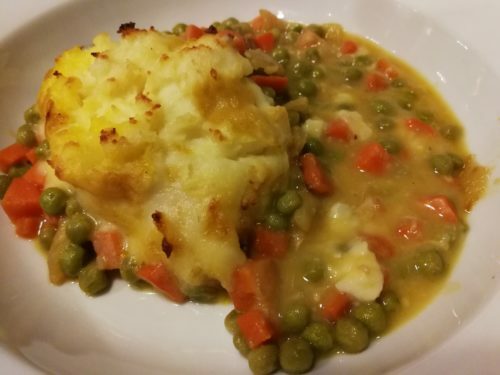 Vegetarian Shepherds Pie. 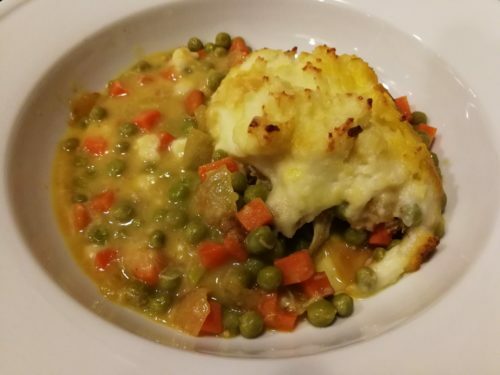 Not just for #MeatlessMonday, my Vegetarian Shepherds Pie is a favorite every day. 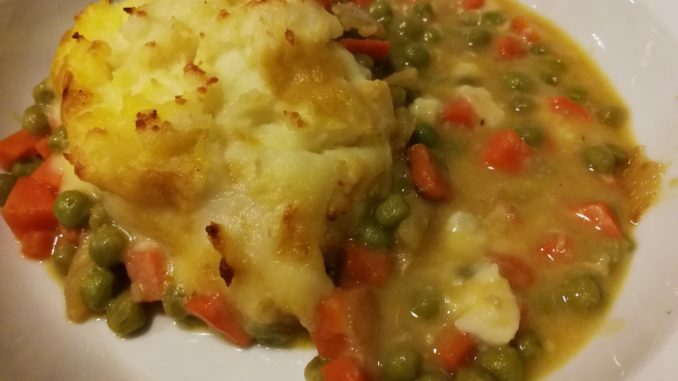 Creamy mashed potatoes top a savory vegetable filling of carrots, onions, and peas. The “pie” is baked until the potatoes are a golden brown and the filling is bubbling. 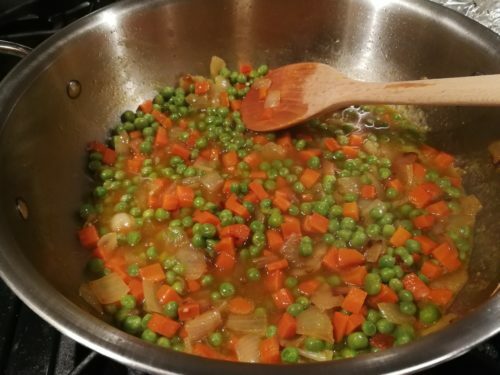 You can use your favorite vegetables in this dish. 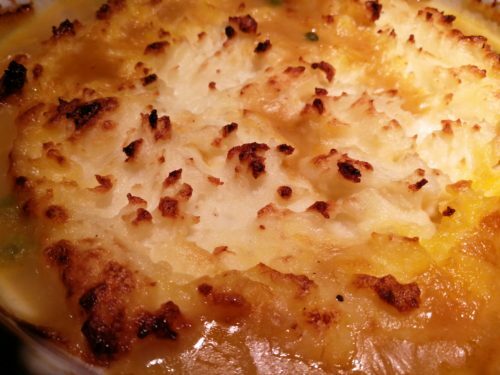 Traditional Shepherds Pie is made with ground lamb. 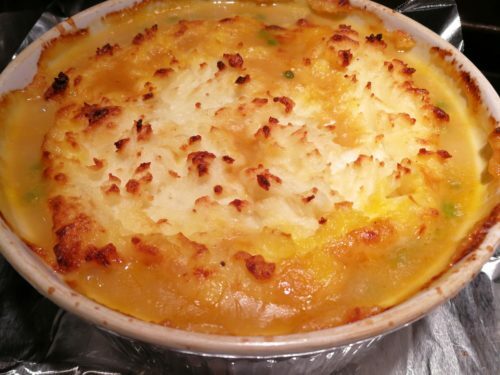 I have some other Shepherds Pie recipes on this site. 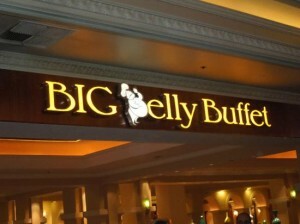 One is made with shredded beef and the other is made with chunks of chicken. A “unique” version for picnics and parties is my Loaded BBQ Pork shepherds pie made with baked beans, BBQ smoked pork, and topped with creamy macaroni and cheese. 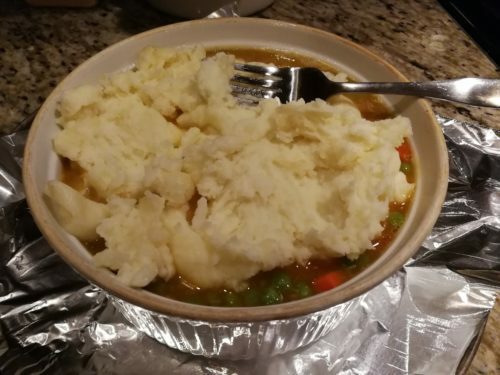 To make my Vegetarian Shepherds Pie, you’ll need 2 cups of mashed potatoes. You can use leftover mashed potatoes or make my Easy Mashed Potatoes. 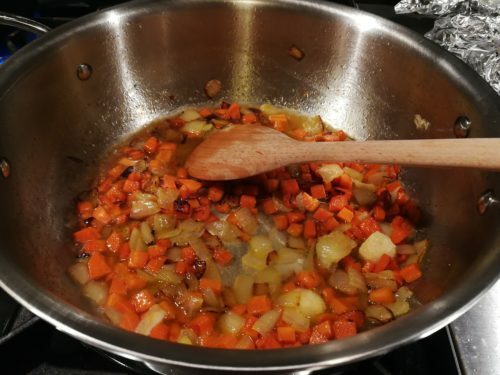 Heat the mashed potatoes and keep them warm while you make the vegetable filling. Dice some carrot and onion and saute in some olive oil over medium low heat. 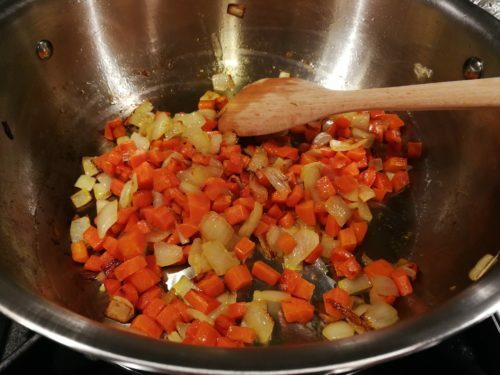 Cook the carrot and onion until caramelized. Add some dried thyme and minced garlic and cook for a minute, stirring constantly so the garlic does not burn. Deglaze the pan with some dry white wine. Add some vegetable stock to the pan. Cook the mixture over medium heat until it thickens slightly. 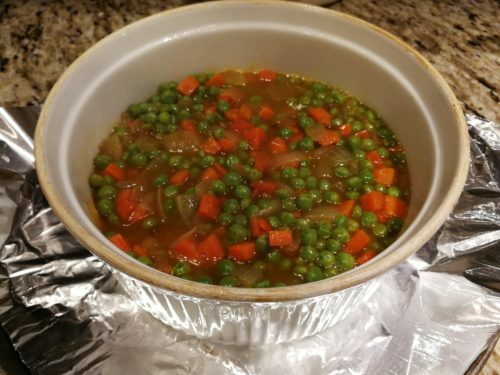 Pour the vegetable mixture into a greased deep baking dish. Spread the mashed potatoes over the vegetable filling. Don’t worry if some of the vegetable filling is visible. Now the Vegetarian Shepherds Pie is ready for a preheated 350 degree oven. 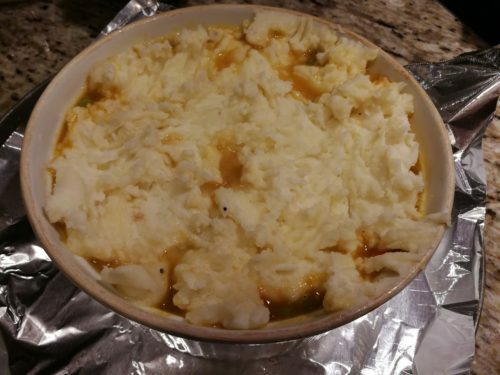 Bake the Vegetarian Shepherds Pie for 30 – 45 minutes until the filling is bubbling and the mashed potato peaks are a nice golden brown. When the Vegetarian Shepherds Pie is done, remove it from the oven and let it sit for a few minutes. Spoon into dishes and serve! My Vegetarian Shepherds Pie freezes well. 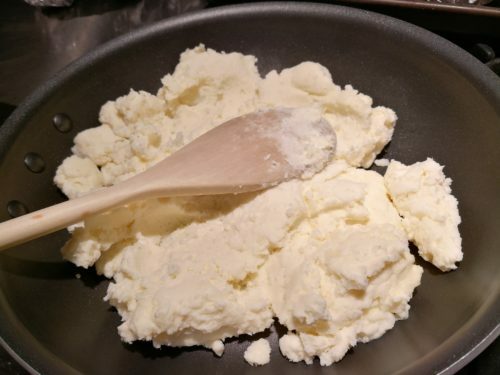 You can freeze the filling separately from the mashed potatoes and assemble, thawed, before baking. Or you could fill individual ramekins to freeze for a later meal. 2. Make the mashed potatoes or reheat leftover mashed potatoes and keep warm. 3. Spray the inside of a 2.5 qt. deep baking dish such as a large ramekin with cooking spray. 4. Heat a chef’s pan over medium low heat. 5. Warm the olive oil in the pan. 6. 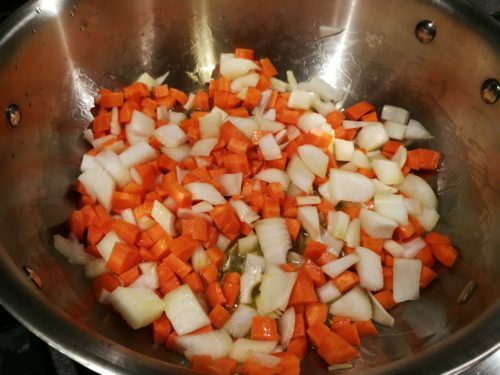 Saute the carrots and onions in the olive oil until the vegetables are slightly caramelized. 7. 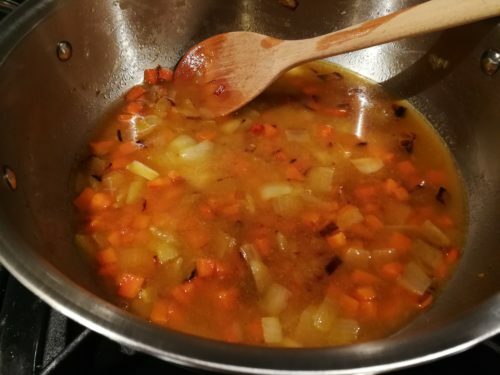 When the carrots and onions are caramelized, add the garlic and the thyme and let cook a few minutes. 8. Deglaze the pan with the white wine. 9. 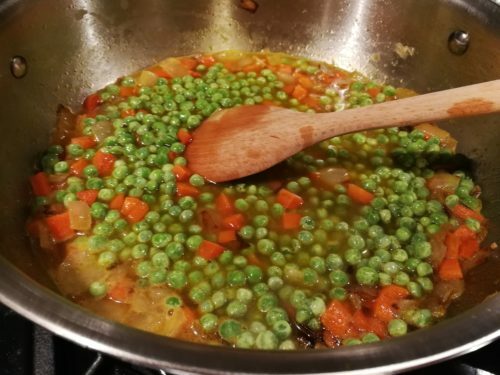 Add the vegetable stock and then the peas and simmer. Let the mixture thicken a bit. 10. Season the vegetable mixture with salt and pepper, to taste. 11. Pour the vegetable mixture into a greased deep baking pan such as a large ramekin. 12. Spread the mashed potatoes over the vegetable mixture. You can drop the potatoes onto the vegetables in large dollops and then use a knife to spread and connect them. Don’t worry if some of the vegetable mixture is peeking through. 13. 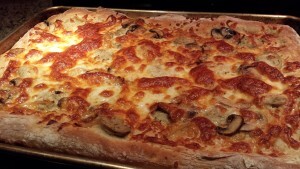 Put the pan into the oven and bake for 30 – 45 minutes. 14. When the vegetable mixture is bubbling and the potato peaks have turned a nice golden brown, the shepherds pie is ready. 15. Remove the baking pan from the oven and let sit for a few minutes to cool down. 16. Serve the vegetarian shepherds pie in a serving bowl or plate. Serves 4 hungry diners. Offer with a salad such as my Simple Cucumber Salad or my Roasted Beet Salad with Goat Cheese and Pine Nuts and some chilled dry white wine. Variations: Add or substitute other vegetables from the list above. Mushrooms and/or lentils add a meaty texture to this dish for your meat-loving friends. You could top the mashed potatoes with your favorite shredded cheese prior to baking for a melty cheesy delight.